Sometimes your newborn needs a little help being delivered. When a natural childbirth does not go smoothly on its own, a doctor may use forceps to help guide the baby’s head out of the vaginal opening. If the doctor uses excessive force, however, he or she could do serious and long-term damage to your child. At Paulson & Nace, PLLC, we help families whose newborns suffered trauma during delivery because of the negligent use of forceps. Our skills have helped to secure the compensation Washington, D.C. families need to look after their child and themselves when negligence during delivery led to a serious injury. The baby is in a breech position, meaning his or her feet are positioned to exit the birth canal first. Underlying health conditions make it impossible for the mother to give birth unassisted. The baby is showing signs of fetal distress. The labor has stalled, meaning the mother has been pushing but no child has yet emerged. Your child has not fully descended into the birth canal. Forceps are commonly used in first-time births, because the delivery of your first child is sometimes more challenging than the birth of subsequent children you may have. Forceps are incredibly useful tools when used correctly. But when a doctor attempts to use forceps on a child who is too far up inside the mother, or on a woman who is not fully dilated, the doctor is putting the child and the mother at risk. The problem with forceps is that if the doctor is not careful, he or she can use them too forcefully. The pressure can literally squeeze your child’s head and lead to a skull fracture. The baby may have permanent facial disfigurement, partial or full loss of eyesight, or suffer with permanent brain damage or facial paralysis. If the child is already showing signs of fetal distress, it is possible for the baby to have a seizure – and the forceps, if they do not trigger the seizure in the first place, can permanently scar your child. A negligent doctor may also tear the bladder or uterine walls, increasing the mother’s chances of developing a serious infection, such as sepsis. It is also possible to render a mother incapable of having more children if the damage done by the forceps is too great or leaves too much scar tissue. 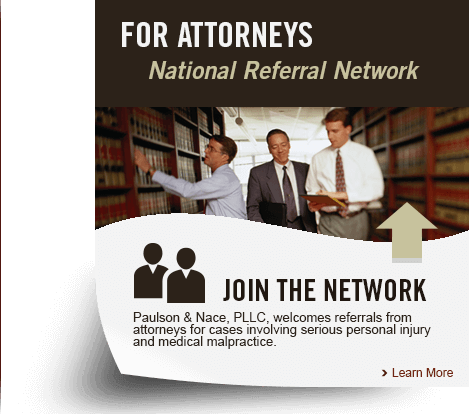 Paulson & Nace has helped Washington, D.C., families just like yours whose doctors negligently or incompetently used forceps on a new baby. We understand how even the seemingly smallest errors can have lifelong repercussions for the baby and the mother. The statutes of limitations in medical malpractice cases vary between D.C. and WV, so it is crucial that you seek our help quickly, so that we may assess your options and help you decide how to move forward. Your child deserves the best possible start at life. A negligent doctor, midwife or attendant can take that chance away from your baby in the blink of an eye. Paulson & Nace, PLLC, proudly represents families in Washington, D.C. whose healthcare providers caused irreparable damage with forceps. Please call 202-930-0292 or fill out our contact form to learn how our family can help yours.